Normal: Let them Eat Cake! In September Normal held their annual staff retreat. Keep that number in mind when your property taxes are raised tonight because the Town isn’t capable of setting priorities. Posted in BloNo, Koos, Local, Normal, Progressives, Taxes.Tagged staff retreat, Starved Rock Lodge, TOWN OF NORMAL. Looks like it takes a village to raise a city. Lots of Directors. Had to travel to Starved Rock. Seems like there are a couple on nice conference centers in Normal. Oh well, its on the taxpayers back anyway! 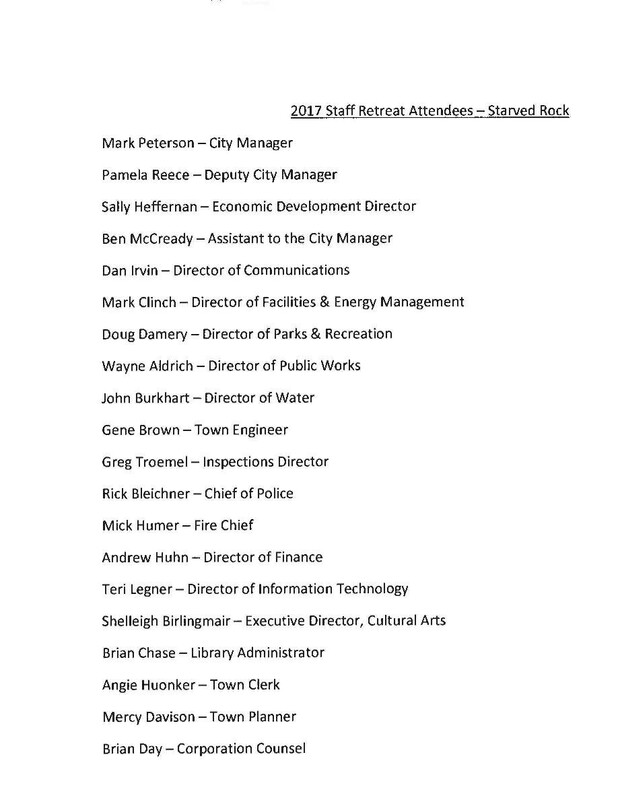 They are supporting the economic development of the region immediately surrounding Starved Rock instead of our local economy. Brilliant!! They always have to go somewhere, and it’s always somewhere nice, it’s part of the perks we pay for, they are very important people you know, they do all of the important work….We should be grateful to them and just pony up whatever they demand, and eat at Portillos and wait for the magic car to appear like good and faithful peasants. Gotta have a laugh that even the FINANCE director went. Kind of IRONIC! We should be gratedul for all their hard work. Previous Post Normal: It’s the Council’s fault!